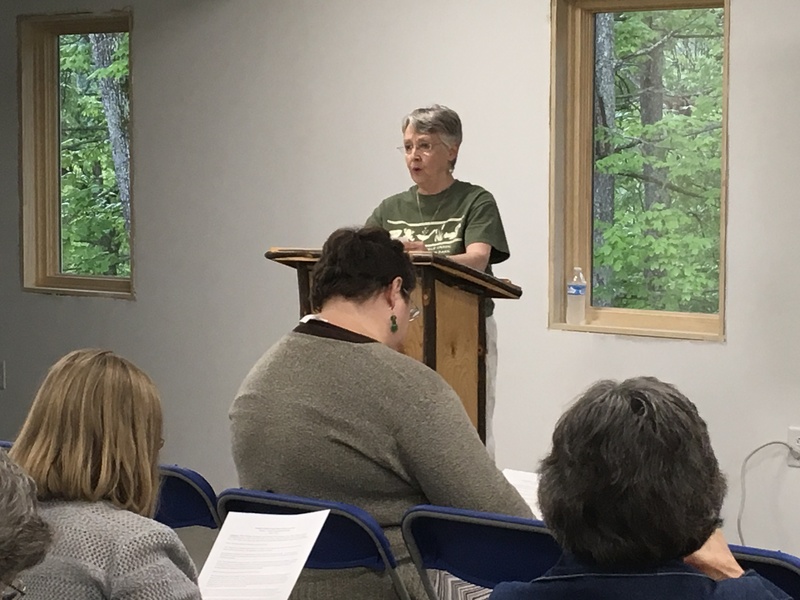 Friends of Steele Creek Nature Center and Park’s 2017 annual membership meeting was held on Saturday, May 6th. By all accounts, it was a great success. Attendees arriving early were treated to a sneak preview of the Nature Center’s new addition. Although none of our future exhibits have been built, large graphics on display (designed by Ed Hackley) give an accurate visual interpretation of what’s to come. The first order of business was a presentation by Cody Blankenship on his research project “A Camera-trap Survey of Mammal Species in Steele Creek Park”. Cody recently graduated from King University. His project was funded by a Friends research support grant, and his faculty sponsor was Board member Joshua Rudd. 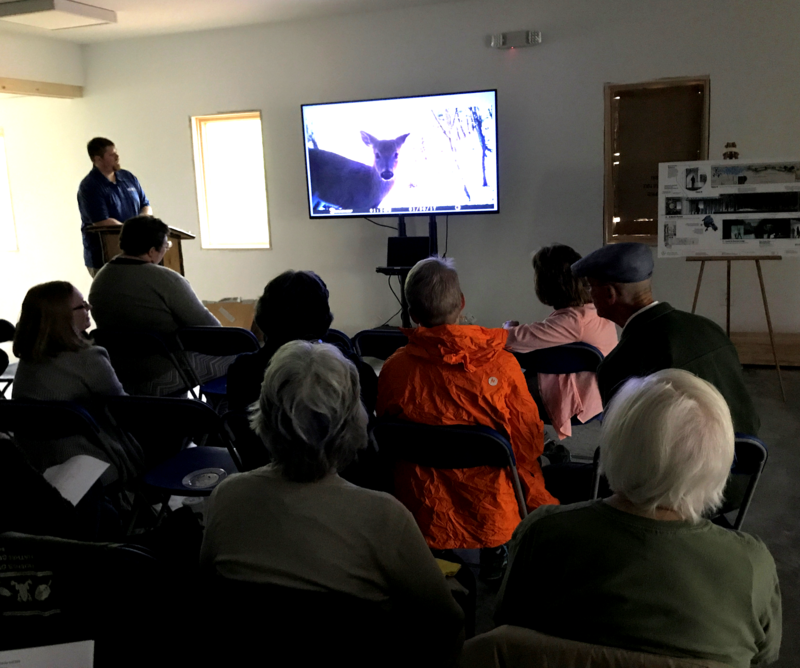 He presented results from his study of wildlife documented in the Park since January using camera capture technology. More information about the study and his findings will be forthcoming. Longtime volunteer member Ruth Clark was then recognized for her dedication, leadership, and hard work in establishing and maintaining the Herbarium at Steele Creek Park. 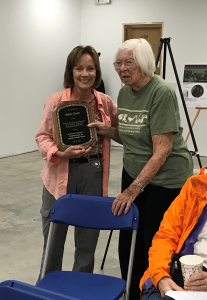 On behalf of the Board of Directors, Volunteer Coordinator Michele Sparks presented Ruth with a plaque to be displayed permanently in the Nature Center, and a Sassafras tree with its accompanying signage which will be added to the Steele Creek Park Arboretum in the near future. She was also presented with an annual Park Pass and certificate for her outstanding work. 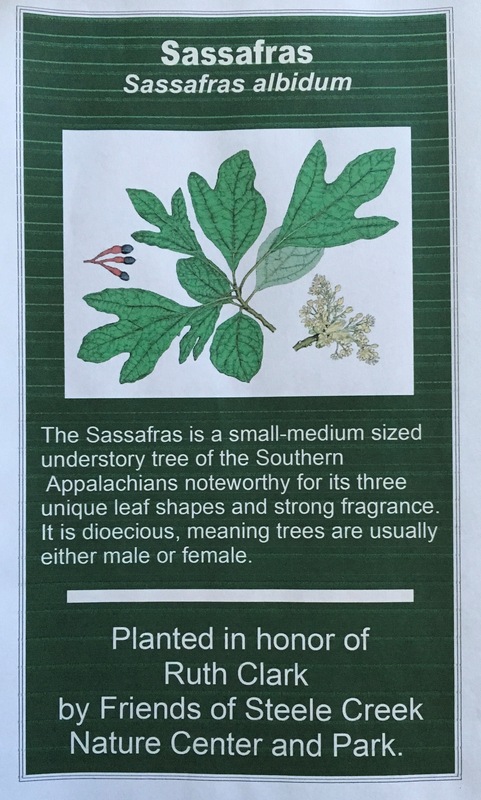 In addition, certificates of appreciation were presented to Mary Clark, Sharon Foster, and Adrianne Hess for their invaluable assistance to Ruth in establishing and maintaining the Herbarium. Sherry Willinger detailed the busy fiscal year which concludes next month; most, but not all of our activities have been focused on the NC expansion. Sonie Schermer gave a brief history of the Park and the Nature Center, and an update on the progress of the Nature Center expansion. We anticipate having at least five of the major new exhibits in place in time for the grand opening during Wildlife Weekend in October. Work will then begin on renovation of the old building. Robin Feierabend then reported on our fundraising efforts for the expansion. To date, we have raised over $200,000 in donations received and pledges due prior to our October opening. We are not quite halfway to our goal for fully implementing the plans proposed by Ed Hackley. Information on our revised membership structure and fees, recently approved by the Board was distributed and can be found elsewhere on our Membership page. Two amendments to our bylaws were presented for consideration. One allows for electronic participation in Board and Executive Committee meetings; the second, which was modified somewhat during the discussion, allows for the Board and Executive Committee to vote on matters electronically without face-to-face meetings. Both amendments were approved unanimously and can be found on our Bylaws page. Our final order of business was establishment of our Board of Directors for 2017-18. Those present voted to maintain the Board size at 15. Two Board members whose terms are expiring at the end of June (Tracy Pierce and Michele Sparks) were elected to new three year terms, and five new Board members were elected to begin serving on the Board as of July 1.